Visitors to the French ski resort of Courchevel witnessed an unlucky pilot fail to stop his plane in time during a landing and then crash into a pile of snow. 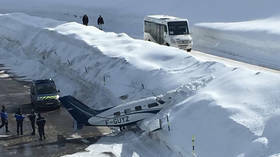 The footage shows a small Piper PA-46 aircraft rolling away from the off-strip and ploughing into the pile of snow nearby. The plane had five passengers on board, according to local media. Four of them received injuries and were treated in the medical office nearby. One young woman was reported to be seriously injured. Small Piper planes have been involved in a number of crashes recently. A Piper Malibu plane carrying Cardiff City footballer Emiliano Sala and his pilot, crashed during the journey from Nantes in France to Cardiff on January 21. After weeks of searching, the aircraft and the body of Sala were discovered in the English Channel near the French coast. The tragic death of the Argentinian forward left the football world grieving and the search continues for the plane’s pilot.